This Gates Hi-Power II belt is a multipurpose power transmission V-belt for widespread applications. It is made of EPDM (ethylene propylene diene monomer) rubber for resistance to weathering, oils, water, and some solvents. Its cords are bonded to the body are strongly bonded to the body of the belt for equal load distribution and reducing bending stress without deterioration of the cord. Its concave sidewalls provide cord support and full contact with the sheave groove for equal loading and uniform wear. 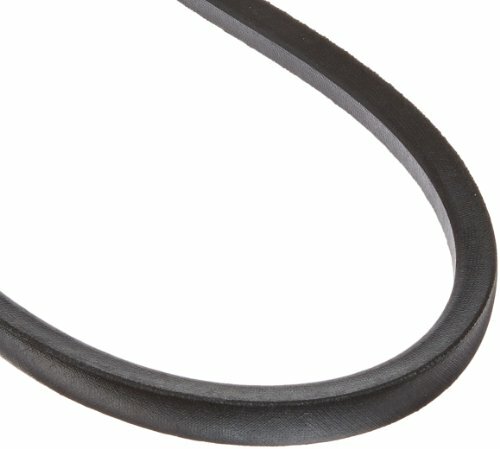 Hi-Power II belts are part of Gates' V80 matching system, which guarantees that all belts of the same type and size will be more precisely matched than the Rubber Manufacturers Association (RMA) and International Standards Organization (ISO) standards require. The result is even load distribution on multi-belt drives and better wear. This V-belt meets RMA oil and heat resistance standards and static conductivity requirements and is suitable for use in all industrial applications, including V-flat drives. V-belts, also called fan belts in automotive applications, link two or more rotating shafts to transmit power in a drive system. The trapezoidal shape of the belt's cross section wedges into the groove of a similarly shaped sheave or pulley to provide traction and alignment. This wedging action increases as the load increases, providing higher torque transmission and minimal slippage. V-belts are standard for belt-driven power transmission and can be used in single- or multi-belt systems for increased carrying power. They are found in drive systems in the automotive, agricultural, textile, printing, mining, and office equipment industries, among others. Gates manufactures power transmission and fluid transfer components and systems. The company, founded in 1917, is headquartered in Denver, CO. If you have any questions about this product by Gates, contact us by completing and submitting the form below. If you are looking for a specif part number, please include it with your message.